SanDisk Cruzer flash drives are built to last. They’re very well constructed from their firmware to their circuit board. SanDisk flash drives use a durable circuit board design to withstand the rigors of normal wear and tear however this durability can also be a flaw. 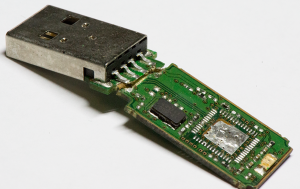 The USB connector is firmly attached to the circuit board which isn’t a problem for slight bumps but if the connector is bent with force, for example by dropping the flash drive while connected to a laptop it can break the connector or circuit board. The most common type of failures are lifted/torn pads. 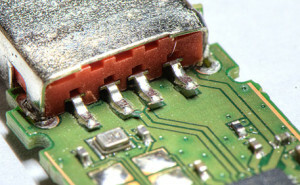 Pads sit on top of the circuit board and make an electrical connection to the USB connector. When the USB connector is bent it can pull the pad off the circuit board breaking the electrical connection, like cutting a wire. Repairing torn pads can be difficult. The traces (wires) going to the pads are very thin which require special soldering equipment to repair. 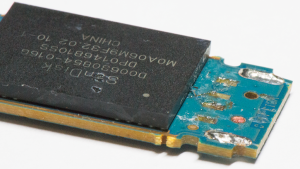 The traces or vias may also be damaged, having a working knowledge of different SanDisk flash drives also helps so you know controller pin-outs and alternate solder points. Improperly repairing pads can irreversibly damage the flash drive. The next common type of failure is physical damage to the circuit board. If the USB connector is bent with enough force is can snap or separate layers of the circuit board. Occasionally this can be fixed by rewiring the damaged signals but it typically requires swapping parts onto a donor circuit board. SanDisk changes circuit board designs frequently, luckily we have a good inventory of SanDisk parts so we almost always have a match. We’ve spent the last 6 years specializing in repairing and recovering data off SanDisk flash drives. In almost every case we’re successful, if you need your data recovered send us your SanDisk Cruzer.